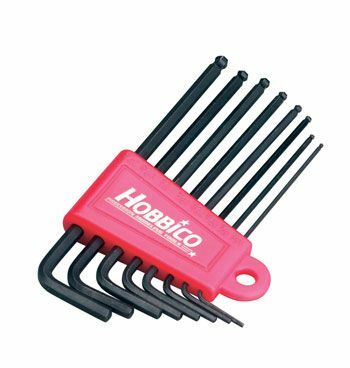 This is a Eight Piece Set of Standard L-Wrenches. One End of the Wrench has a Ball to Allow for Entry Angles up to 25°. INCLUDES: Eight Wrenches: .050", 1/16", 5/64", 3/32", 7/64", 1/8", 9/64", 5/32". Handy Red Carrying Case for All Wrenches with Sizes Marked On Case.